In Letters from Whitechapel, a team of detectives scour the streets of Victorian London, searching desperately for the depraved murderer known as Jack the Ripper. It’s a lot like the classic '80s board game Scotland Yard, but with more bloody murder. Scotland Yard was my favorite board game to play with my cousins when we were young. I didn’t realize it at the time, but it was probably one of the first Euro games to infiltrate the U.S. mass market. The gameplay was unlike anything else we’d played – there is no element of randomness in the game at all. A criminal (Mr. X) moves around London, secretly recording his location and covering it up with tickets that indicate the type of transport used. The detective have to work together to figure out where he is and move onto his space, only spotting him when he “surfaces” every few turns. I’m talking about Scotland Yard because Letters from Whitechapel is essentially a slightly more complex version of the same idea, with a fresh coat of Jack the Ripper theming. As soon as I sat down to play a demo of it at Gen Con and realized this, I fell in love with the game. There are no dice to roll or decks of cards to draw from. Everything that happens in the game is a player’s choice, and success or failure depends entirely on whom outwits whom. It's published by Fantasy Flight Games with higher quality components than those found in the original release. Let’s talk about game theory for a moment. Randomness is a vital element used to create tension in many wonderful games. If you strip away all randomness, you get a game like chess. Certainly chess is not a bad game and there are millions of people who love playing it. But it is a certain kind of game, and you can’t declare that there’s any kind of inverse relationship between randomness and the quality of a game. I, personally, don’t like chess all that much. But randomness isn’t the only factor at work. 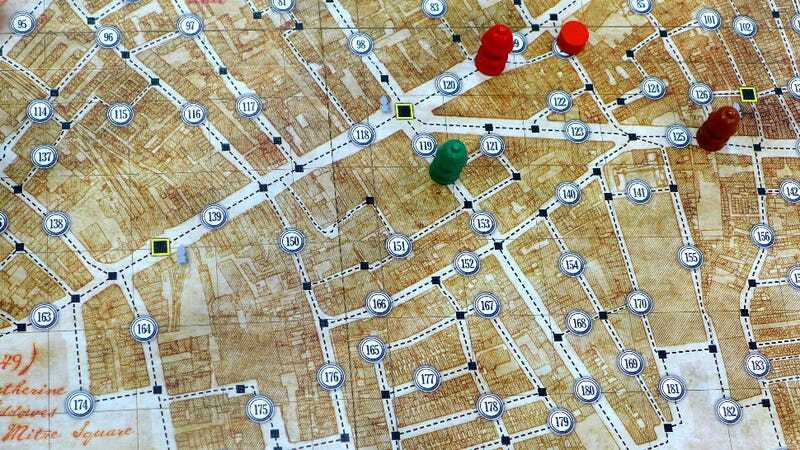 While Letters from Whitechapel, Scotland Yard and similar games have the same amount of randomness as chess, they have one important difference: imperfect information. Imagine playing chess and knowing that your opponent moved her rook, but not where she moved it. Or if the king moved secretly, only showing up on the board every fifth turn. It adds a level of intrigue and deception that makes the game more interesting (to me, at least). Another interesting thing about non-random games is that they can be broken down into purely mathematical constructs. “Chase” games like Letters from Whitechapel are based on a mathematical problem called pursuit-evasion – mathematicians try to find the optimal search patterns given varying conditions, such as the speed of the pieces and the size of the board. In fact, if you poke around board game forums, you’ll find that people have graphed and found optimal search patterns for Scotland Yard. You can drastically change how a pursuit-evasion game operates by making small changes to the initial settings. For instance, in Letters from Whitechapel the detectives have a velocity of two spaces compared to Jack’s one. However, Jack gets a few special moves, allowing him to duck down alleys or take a carriage. One major difference that makes life for Jack much harder than it ever was for Mr. X is that Jack has a specific place he needs to get to (chosen by the Jack player at the start of the game). The detectives begin to narrow the search by seeing where Jack heads toward after each murder. When they search an area, they can tell if Jack has passed through there at any point on the current turn. I won our playtest game by narrowing Jack’s home base down to a city block. On the third night I didn’t even search for Jack, I just flooded that block with detectives so he couldn’t possibly get home. Game theory aside, is Letters from Whitechapel a good game? I like it a lot, but a little bit of that might be tied to nostalgia for those summer afternoons trying to fool my cousins with sneaky Mr. X maneuvers. The theming is wonderfully done, with just the right amount of gaslight horror. The game board has notations pointing out that potential murder locations correspond to the actual murders. The board is not a simple grid, but rather a tangle of alleys and oddly shaped city blocks that evoke the ramshackle world of a 19th century London slum quite well. There are even letters that the Jack player can use to fool the detectives, each of which matches (and contains the full text of) one of the letters supposedly sent by the killer to taunt authorities during the murders. The game is prevented from becoming a simple math problem by a few details that muddy the waters in fun ways. There’s a pre-murder part of each of the four game nights in which both Jack and the detectives shift around the board and move around the prostitutes that may eventually be killed. Also, Jack and the detectives move on different grids that overlay each other. That is, if you imagine a graph, Jack moves to nodes on the sides of squares while the detectives move along nodes at the intersections. Of course the map isn’t a perfect grid, so Jack can sometimes move past multiple detective nodes at once, or find himself adjacent to an unexpected number of nodes, all of which are subject to searching by the detectives. So the game never feels like an equation, despite the mathematical underpinnings. You can play with two players (one as Jack, one controlling all five detectives), but the more detective players you have, the harder it gets for them. Even though everyone has the same goal, it can be hard to get them to agree. In the end, you really have to outthink your opponent, and there’s no clear path to victory. Deception is key, and there are many viable strategies. Should Jack go straight to his base or try to create misleading clues? Should the detectives fan out or focus on one area? I think Letters from Whitechapel will be our Halloween night board game of choice this year.